Welcome to Paradise! Compare our almost 4,000 sq.ft. home to any other property and you realize you have found the real deal. Casa Acuario is the very best! Unprecedented luxury in a building built to the highest quality standards. This luxurious 3-bedroom, 4-bathroom condo is absolutely gorgeous. It's ideal for a group or family and can sleep 6 adults comfortably. Unbelievable wrap around balcony! True luxury 4 bedroom home with everything located right on the Blue River just minutes from the Breckenridge town and ski resort. Front corner luxury condo with uninterrupted views of the sea. Wraparound poolside walkout terrace connecting from dining room to Master suite. Gorgeous decor in soothing earth tones. Sumptuously furnished. All beds pillow top. Can sleep up to 6 guests. 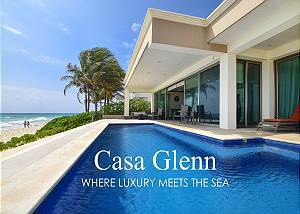 New Playacar Beach house,4 Bedroom, 3.5 Bathrooms, Sleeps 10 people in beds. Located in Cozumel, this breezy top-floor condo with rooftop access is available for short/long-term stays.The Corpus Christi neighborhood is a beautiful downtown area with a scenic church.